The reason most people are in debt is due to credit cards. These little pieces of plastic tempt you with high limits and low payments. They are simple to use and often a hard habit to break. 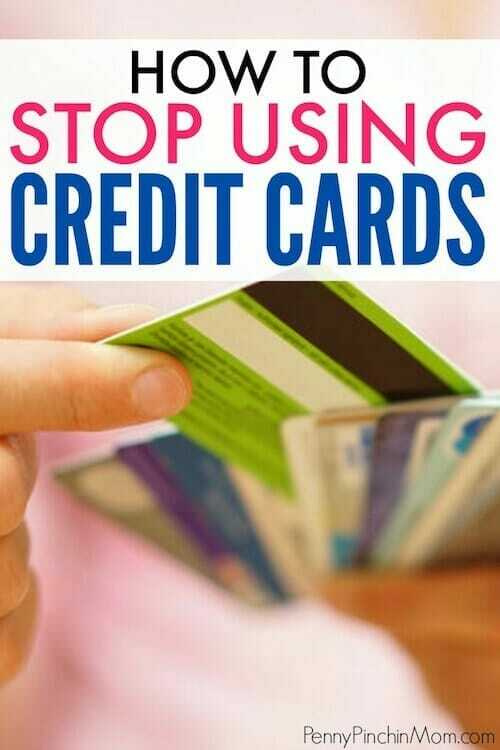 You have to teach yourself how to stop using credit cards and end the cycle of more debt. According to the Federal Reserve, Americans have accumulated $992 billion in credit card debt (as of November 2016). While many people pay them off every month, there are thousands of others who do not. They just pay the minimum and then continue to use the cards, resulting in increasing debt. If you are serious about wanting to get out of debt, you have to take steps to stop using your credit cards and racking up more debt. It is so easy for someone on the outside looking in to tell you to stop spending. However, if it were that simple, you would have quit long ago, right? Before you can stop spending, you have to know why you are doing it. Your reason could be to replace something missing in your life. It might be the high you get from spending. Your logic is not wrong. It is your own. Once you understand why you shop, you can then start to work on that, and in turn, your desire to buy as much can slowly fade as well. Knowing the reason why is one of the first things you must do finally break the cycle of credit card debt. I know that this is pretty extreme, but the truth is that it works. If you do not have cards to use, you can’t rack up additional debt. If you are nervous about getting rid of them altogether, put them on ice. Literally. Put your credit card in a bowl of water and freeze it. When you feel you need your card, it will be more challenging to get to, and the urge to use it may pass more quickly. One thing that goes hand-in-hand with cutting up the credit cards is sticking with cash. That doesn’t mean a debit card. It is using paper money. When you use cash, you have to think twice about what everything costs. When the money is gone, you can’t spend any more. When you use a debit card, you can still spend more than you intend. That is never the case with cash. If you have $100 to spend with cash, you can not make a purchase that is $105. But, with a debit card, you still can. It is far to easy to swipe plastic. A simple trick to sticking to not using your cards is to set up milestone rewards. For instance, if you can go one week without using your card, allow yourself an extra coffee the following week. As you reach more and more milestones, such as paying off a card, going six months without using plastic, etc., set up small rewards for yourself. Just make sure that you never cover the cost of your reward by using your credit card!! If you want to stop using credit cards and pay off your debt, it is helpful to have a goal in mind. It may be to afford the new car you want or buy a home. It might even be to live without feeling so much stress. Whatever your reason, create a vision board. When you have a clear vision of what will happen when you reach your goal, the more likely you are to stay on track. The best way to stop is to have someone to help keep you on track. An accountability partner can do just that. If you are in a relationship, you will be accountable to your partner (of course). However, if you both have a difficult time not using credit, you might want to look beyond yourselves. Find another couple who is in the same situation as you are and become accountable to one another. However, if you are single, then it may be a bit more challenging to find someone. Reach out to friends and family to find someone with whom you can connect and help one another. When you have a cash budget, you get into the habit of doing this. However, if you are not ready to make that leap, start tracking every purchase you make. Sometimes, seeing where you spend your money can be enough to make you want to throw the credit cards away for good. You absolutely must have a budget. There is no way to get around it. But, more than just a budget, it needs to be a budget that works. Sit down and go back over your budget to see where you may be spending too much and see if you can find ways to make improvements. Also look carefully at how much money you spend on credit card debt each month. Imagine what you could do with that money if you did not have to send it away to someone else. Put some simple strategies to work and you’ll stop using credit cards and can get in control or your money. Finally.